Late one night, a young man named Mikael Kohler-Frost is found wandering across a high railroad bridge outside Stockholm. His jeans are stiff with frozen blood. Fresh blood trickles down his arm and drips from his fingertips. When he’s brought to a hospital and identified, it’s discovered that he and his younger sister went missing 13 years ago. When he’s able to speak, he tells police he has escaped from someone he calls the Sandman and that his sister, unbelievably, is also still alive. 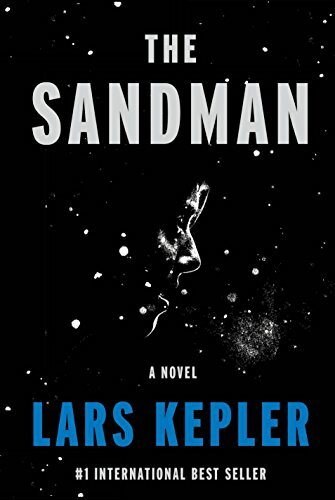 Published in Sweden in 2012, The Sandman is the fourth of six crime novels featuring veteran Detective Superintendent Joona Linna of the National Crime Police in Stockholm. Joona has always believed that Mikael was a victim of Sweden’s most notorious serial killer, Jurek Walter, who was captured by Joona and now serves a life sentence in a maximum-security psychiatric hospital. Desperate to find Mikael’s sister and to solve the mysteries of other disappearances attributed to Walter and a possible collaborator, Joona convinces his prodigy, Inspector Saga Bauer, to enter the psychiatric hospital undercover to make a last-minute attempt to learn something from Walter that will point them in the right direction before it’s too late. Lars Kepler is the pseudonym of husband-and-wife writers Alexandra Coehlo Ahndoril and Alexander Ahndoril. She began as an actor before publishing her prize-winning first novel Stjärneborg, based on the life of Tycho Brahe, in 2003. He made his literary debut at age 22 with a romance novel before publishing Regissören, based on director Ingmar Bergman, in 2006. Their work in the Joona Linna series, and in The Sandman in particular, is exemplary. Joona is the kind of protagonist you hope to discover in a Scandinavian crime novel. He’s understated and moody, and he sacrificed everything in the past to capture Jurek Walter. Saga Bauer, his detective understudy, is tough and self-reliant, and has no luck in romance. When she goes undercover to get close to Walter, we hold our breath in apprehension as each chapter takes her closer to disaster. The Ahndorils have an excellent writing style. This is a book that will keep you up all night, unable to turn off the light, because the pages almost literally fly beneath your fingers. Chapters are short, in many cases only two pages in length, and the action moves forward at a relentless pace. Such a light touch, but with this image we feel the coldness and silence, the stillness disturbed only by the drifting snow and the cautious movement of the police, and the inescapable tension in the air. The Sandman is an excellent crime novel. Alexandra Coehlo Ahndoril and Alexander Ahndoril are a terrific writing team that deserve every accolade they receive. You won’t be able to resist the urge to read all six Joona Linna novels, and you’ll fervently wish there were more.